Argentina are invariably amongst the World Cup favourites, but their recent record is surprisingly poor. Since finishing as runners-up in 1990, they’ve reached the quarter-finals three times, the second round once, and were eliminated at the group stage in 2002. The likes of Sweden, Bulgaria, Uruguay, Turkey and Croatia have reached the semi-finals more recently than Argentina. This is unquestionably a more organised unit than four years ago, however, when Diego Maradona’s haphazard management style failed to get the best out of the attackers, and the lack of compactness left the back four hugely vulnerable to counter-attacks, most obvious in the embarrassing 4-0 quarter-final defeat at the hands of Germany. Now, Alejandro Sabella has a system, favoured personnel, and will stick to his beliefs. His starting XI in the group stage will be his eleven most-selected players throughout qualification , which sounds obvious, but it’s rare for international managers to remain so committed to players over such a long period. While Sabella experimented with a 5-3-2 system in qualifiers, this was exclusively a defensive-minded option away at sides who play at altitude, something which has consistently caused Argentina problems over the years. His default system is a slightly unusual 4-3-3 that plays primarily on the counter-attack. In terms of individual quality upfront, no other side can match Argentina. Lionel Messi, Sergio Aguero and Gonzalo Higuain are amongst the most effective attackers in world football. Yet while Argentina traditionally also produced strong centre-backs and consistent full-backs, there’s a big concern over the lack of quality in the defensive section of the side. It means that organisation is absolutely paramount – a side can compensate for a lack of individual quality at the back with good structure, strategy and understanding. If that is in place, there’s enough talent in this side to do serious damage on the break, but if the defence falls apart, Sabella will face huge criticism for not protecting his back four with more disciplined players. The concern starts in goal, where Sergio Romero has been a back-up all season for Monaco. 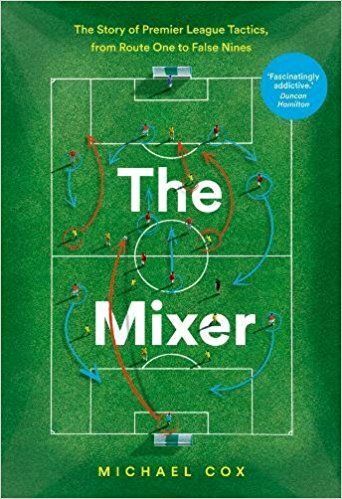 This, incidentally, is a bizarre, common feature amongst the three favourites for the competition – Spain’s Iker Casillas and Brazil’s Julio Cesar also found themselves back-ups last season. However, Casillas was a regular in the European Cup and Copa del Rey, winning both competitions, while Cesar went on loan to Toronto to get playing time. More pertinently, both are, or at least were, world-class goalkeepers. Romero is not, and never has been – he simply makes too many errors, and there’s a feeling one could cost Argentina here. The back four is underwhelming in terms of personnel. Benfica’s Ezequiel Garay is a solid enough centre-back, but it’s difficult to see why he’s relentlessly linked with big clubs, while Federico Fernandez is decent but doesn’t excel in any one particular area of defending. If protected well and given minimal responsibilities aside from clearing the ball, they won’t embarrass Argentina, but if Sabella needs to chase games and leaves the centre-backs exposed, it won’t be pretty. Pablo Zabaleta is the archetypal consistent full-back – extremely energetic, strong in the tackle and an attacking force simply because he keeps on running. He can stick too tight to opponents and get himself into awkward positions high up the pitch, however, and he might be better off staying tight to the centre-backs. The same is true of Marcos Rojo on the other side, primarily because he’s a centre-back by trade – he’s Argentina’s weak link. The defending of set-pieces, meanwhile, has also been a problem over the past couple of years – Argentina lack a commanding aerial presence. The midfielders have very separate roles. Javier Mascherano plays in his traditional holding midfield position and barely moves more than 15 yards ahead of the centre-backs. More accustomed to playing in defence for Barcelona these days, he’s not far off being a third centre-back and keeps his distribution very simple. Fernando Gago has suffered with injuries recently, but remains a crucial part of the side. He plays just ahead of Mascherano but generally holds his position and leaves the attacking to the front four. He has a great responsibility in a positional sense – if he’s caught ahead of the ball at defensive transitions, Argentina could appear very open. His passing can be attractive, but he spreads play nicely without providing many penetrative balls. Then there is Angel Di Maria, and while not the best player in the Argentina side, he’s the key player. Often misunderstood as a pure winger, Di Maria has always favoured a deeper and more central role, having made his name at Benfica as a shuttler, played a similar role under Maradona, and excelled under Jose Mourinho by providing the balance and defensive discipline on the opposite side to Cristiano Ronaldo. His two best performances for Real Madrid this season came in big games, a 4-3 Clasico defeat to Barcelona and then the European Cup final, where he showed his ability to provide an attacking threat on the left while also playing an important defensive role. His displays for Argentina should be comparable to his European Cup final performance – always breaking forward from midfield on the counter-attack, connecting midfield and attack. Di Maria will try to penetrate the opposition backline as quickly as possible with balls for the three attackers, but he’s outrageously left-footed – expect slightly unnatural chips, outside-of-the-boot passes and the odd ‘rabona’ if really necessary in order to launch the ball past the opposition backline. His incredibly demanding role means Sabella often substitutes him if Argentina are ahead, conserving energy for upcoming matches. Then there’s the front three. They’re individually brilliant, and they work better on the pitch than on paper. Messi is clearly the star, starting in an inside-right position. He’s not quite a number ten, not quite a false nine, not quite a right-winger – he’s somewhere in between. He’s always had a great understanding with Aguero, and a great understanding with Higuain too, and it’s those relationships that make this system work. He’s generally travelling from right to left when dribbling, and always wants Di Maria, Aguero (or sometimes Rojo) making runs from the left to meet through-balls. He’s scored 18 goals in his last 17 Argentina games, and now captains the side too. Higuain plays an unselfish role, often making clever runs to create space for the other two forwards, both towards the ball and towards the flanks. He’s become much more effective at racing in behind the defence over the past two years, too, and this is a feature we should witness regularly, as Argentina look to hit opponents directly. Aguero is the most expendable of the front ‘four’, and Sabella might opt for more tactically disciplined players occasionally – Ezequiel Lavezzi, for example, who doesn’t offer Aguero’s goals but provides width, balance and hard work. Unusually for Argentina, there’s no genuine star waiting to come from the bench. Lavezzi, regular sub Maxi Rodriguez, Rodrigo Palacio and Ricardo Alvarez are workers rather than world beaters, with Carlos Tevez never in favour under Sabella. 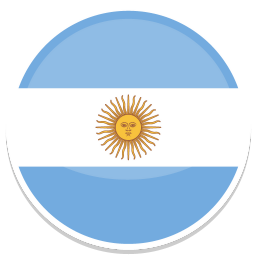 Argentina should score goals, and should play with confidence. They have a good recent record against big teams – they’ve defeated all four 2010 semi-finalists in the last four years, for example. However, they have drawn too many games against inferior sides, and Sabella will hope this is because of the lack of intensity in meaningless friendlies, rather than a sign Argentina aren’t good enough at breaking down packed defences. Argentina’s task is all about maximising their strengths and hiding their weaknesses. That’s pretty much true of any team in any competition, but it’s rare to find a side at any level with such a difference in quality between two sections of the side. Sabella will pay more attention to the weaknesses, in the knowledge Messi and co will provide individual magic upfront. Coach: Alejandro Sabella, a pragmatic coach who once said he was happy to win half-nil. Key tactical question: How good is the defensive organisation? Everyone is doubting Argentina’s defence, but they are pretty decent. They didnt allow in a bucket load of goals in the qualification or in the friendlies. Garay and Federico have built a good understanding. Their worry would be Romero, but for me, Argentina’s major issue would be the form and fitness of Gago. Both Masche and DMaria are excellent, but it is Gago who theoretically assume the role of CM, and might turn out as their weak link, if he is injured and even more against a physical opponent. And his subs, are not good enough to start a big game, if Gago isnt there. See how Messi had to play like CM for long period in the Trinidad Tobago friendly. Messi comes deep down, when he cant get the ball, and that is when we see Argentina has a midfield issue. Against Slovenia too, especially in the first half, Argentina was struggling to bring the ball up from the back. If Argentina doesnt let in an unfortunate early goal, like they did against Germany last time, they are a team who can go all the way. Rather than an average defense and average goalkeeper. I would say Argentina have a solid defense and a horrible GK. I also agree that Garay and Federico are solid players and Zabaleta can be considered borderline world class in his position. Even Rojo is a pretty good full back. Anywhow, Argentina’s back 4 are certainly better than they were last WC when they had a very old Heinze and Otamendi playing as FB out of position. Their CB’s back then had big reputations but were at the end of their careers. The back 4 is not elite but certainly better than most other nations. In fact Argentina should be more worried about their defensive mid than their back 4. Gago is a cipher who has failed at every club and has horrible fitness. It’s been 4 years since Masch has played defensive mid regularly and he’s 30 years old. Biglia and Enzo are okay players but not fantastic defensively. To be honest, I don’t know about Agusto Fernandez . Then you have Romero who is the worst GK in the tournament. Argentina allowed 15 goals in qualifying which was 2nd best after Colombia which allowed 13. Uruguay which is supposed to have a great defense conceded 25. 3 of those goals came against Uruguay in the final throw-away game which Argentina had no need to win and fielded an experimental lineup. Conversely, Uruguay desperately needed the win. The back 4 was Dominguez-Campganaro-Fernandez-Basanta, i.e. only 1 out of the starting 4. Furthemore, in the 6 friendlies they’ve played since qualifying, they have conceded only 1 goal in 6 matches (1 against Italy). 3 of those 6 nations are in the WC (Italy, Ecuador, Bosnia). From what I’ve seen under Sabella, Argentina have dramatically reduced opponent counterattack chances and been much better defending set pieces. However it is true they have been run over in midfield (like in 2010?) a couple times, notably against Germany and Chile. I suspect ZM is correct saying that despite of average defensive talent, Sabella has so far created a good defensive team by focusing on organization. Now we will see what happens under pressure. Judging on every weekend of portuguse champiosnhip football of the past 2 years Rojo is an awful, horrible full-back: a physical monster with no positional sense who always taking the wrong decisions – he’s the real liability of Argentina’s defense. He was actually bought as a centre-back but proved so unreliable that was shifted to left full-back. How do you rate Otamendi above Rojo is also puzzling…. Actually Enzo Pérez can perfectly perform Gago’s role. Even though he is supposedly just another attacking midfielder, he does a great job helping to defend at Benfica and he did had a great season. “A new record after the game against Slovenia for SERGIO ROMERO. http://en.wikipedia.org/wiki/Americo_tesorieri this guy played in the 1920’s so its quite a long standing record to break. Well, let’s not forget that all of those 491 minutes have been friendlies including Slovenia, T&T, Bosnia, Romania, Ecuador. For me this Argentina is a product without guarantee. What Spain has taught the world in the recent years is that the match is decided in midfield. The current Argentina, relies too much on Di Maria while Messi’s unspecified role may be a problem also. Di Maria has been constantly improving as a player but I doubt he can carry all the burden he is supposed to. Luckily for them, they have a relatively easy draw and this is their main advantage as they can peak momentum in their way. Enzo Perez could be a key part in the midfield. He had a tremendous year with Benfica, shutting down Juventus at Turin in the Europa League semi-final. In Argentina’s last friendly he played the full 90 minutes. The eleven posted above is the confirmed starting eleven for Sunday but should change as the tournament wears on. As you mention, Agüero will likely be subbed by Lavezzi (or Palacio) or replaced by Maxi or Perez in a hypothetical second round pairing against an Ecuador side with excellent play on the wings. 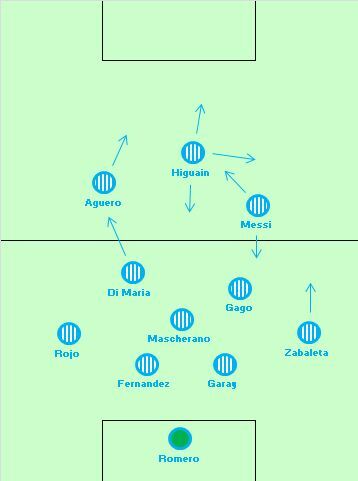 Messi’s free role would then move him into attack, as opposed to a fourth midfielder, and this will mean that they can defend with the requisite 8 players against quality opposition and will have the star off the bench if needed. Gago’s fitness is also a big question as he’s played only the minutes he got in the friendlies since April, and he could also be replaced in the second round. The logical sub was Banega, but his similar lack of fitness and the poly-functional Perez newfound stardom in the CM role for Benfica makes him an interesting alternative to Gago’s sub Biglia. His energy would offset his lack of visionary passing, but caution would have to be applied as he wouldn’t want to duplicate the Di María role. It’s true there are no standout names in the back line, but it should also be noted that this is the first edition of the tournament since 2002 where Argentina are taking a consistently fielded back line. Despite playing an integral role in qualification Zanetti was dropped and not replaced by a natural right back in both 2006 and 2010. This tournament sees Argentina taking a tall, competent, and well organized back line that will rightly be questioned if things go wrong but should be an afterthought if things go right. The question that looms large is how will this side react to their first legitimate challenge? On Garay: if you wonder why he’s constantly being linked with the “big” clubs you should have watched him closely since he joined Benfica in 2011/12 and particularly this season. Absolutely one of the top centre-backs in European football these days: excellent positional sense, very good with his feet, and an attacking menace as well on set-up plays (a good header). Not the fastest player around, but he and Luisao (who’s not fast either) usually play well high up in the pitch with plenty of space behind them; moreover, he’s also used to defend in numerical inferiority during attack-defense transitions, just as Argentina will be forced to. A true classy player, and much better than David Luiz or Chiellini per instance. So, I’m curious: what do you exactly consider to be his weaknesses? 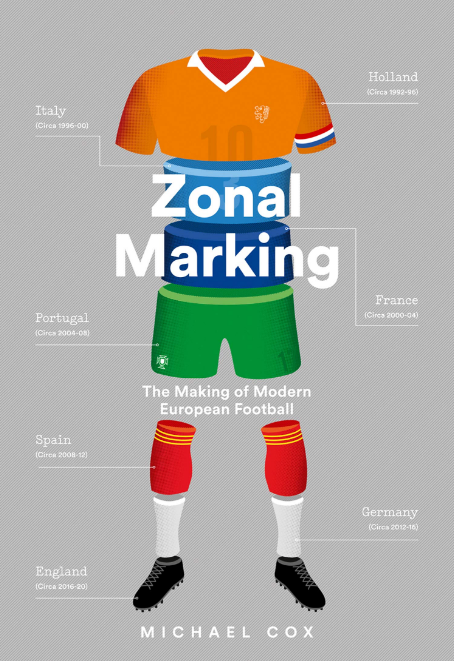 And thanks for the all-round series of previews on the World Cup teams! I’m unconvinced this Argentina side can win the tournament and could actually see them going out early in the second round against France. They attack covers up some real problems in midfield and against better opposition I think they will struggle to get the ball forward to their attackers. Gago is a key player in this regard but has hardly played, and even at his best would struggle against the more physical midfielders he will face. For example if they did face France, Matuidi would constantly be in his face and forcing errors. Without him they rely solely on Di Maria to bring the ball forward from very deep positions, which is fine against weaker opponents, but is extremely hard against a top class midfield. They defenders don’t have even the technical ability to step forward and play ambitious balls out of defence. But they should comfortably top this weaker group. Iran might prove a tough opponent to break down, but Bosnia should play into Argentina’s hands and Nigeria might lack the quality to really expose Argentina. I could see some impressive performances at this stage start to hype up their chances, only to see them crash down in the knockout stages. They might not win the tournament, but second round against France? France defends with a high line and fairly inconsistent fullbacks. So even if Matuidi were to get in Gago’s face, one or two through balls and the defense is in trouble. A deep defending team might be more frustrating because a couple of counters against Argentina’s back line will ask serious questions. Besides it doesn’t go exclusively through Gago/Biglia (who plays a bit more than Gago now). Mascherano’s distribution has also improved and he’s shown a bit more boldness in terms of releasing Argentina’s attackers. Whether he does that in a big quarterfinal remains to be seen but even otherwise Argentina don’t need a lot of possession to still be effective.